A cyclist and triathlete for over 15 years, Kate began coaching in 2007. 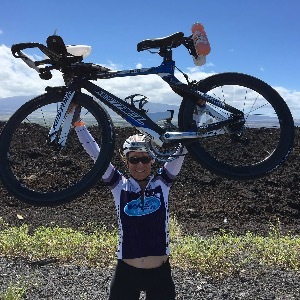 A Hawaii state criterium champion, over-all women's winner of Cycle to the Sun, a Kona Ironman World Championship finisher, multiple time X-Terra Worlds finisher, Kate has a wide range of experience. She is also a military spouse and mom. Balancing life with training is a challenge, but with a creative approach, success is within reach. Kate is dedicated to helping you achieve your goals. Kate is a level 2 USA Cycling certified coach. With over 13 years experience training with power, she is also earned certification in Power Training from Peaks Coaching Group (Hunter Allen). She was selected as a PowerTap Grassroots Athlete for 2016. Kate works in the bike industry so keeps up-to-date on the latest developments. Utilizing the newest training metrics and analytical software, WKO4, Coach Kate will help you get where you want to go. Taking of advantage of the newer training opportunities such as Zwift, and BKool, your workouts will be varied and fun. Kate is now accepting a limited number of new athletes. Athletes should have at least a heart rate monitor, and should be willing to purchase a power meter at some point if they wish to continue beyond "beginner" stage. Success. Coach Kate Johnson has been notified of your message.